Chad Supranowicz was a third grader in 2007, when his mother, Stacie Weldon, gave him a map of the country for Christmas. Rather than highlighting state capitals, it featured the 30 major league baseball stadiums in the United States. The gift came with pushpins in three colors, so Chad could mark parks he and his mother had visited, parks they wanted to visit, and parks they wanted to go to next. 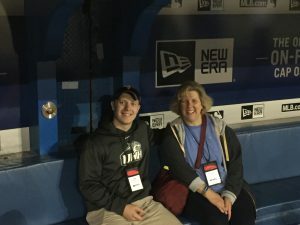 Stacie’s gift for her son, now a 20-year-old finance major at the University of New Hampshire, marked the start of a quest to see all of the stadiums. So far, they’ve been on three trips with Sports Travel and Tours, which have taken them to 13 stadiums, the latest being the Southerner. In their own travels, they visited roughly a half dozen. For Stacie, baseball is something of a family tradition. Her father was a New York Yankees fan, as was his own father. “When my grandparents would take care of me, we’d listen to the Yankees on a little radio,” Stacie recalls. She grew up in the Berkshires where Yankees fans were few and far between, but where New York was just around the corner. Chad is a Boston Red Sox fan like his father. Stacie has enjoyed teaching him about the sport and its all-stars, like Derek Jeter, David Ortiz, Cal Ripken, and Bucky Dent, regardless of the team affiliation. Stacie and Chad took their first trip with Sports Travel and Tours in 2008, the year after Chad received his map of the stadiums for Christmas. They started with a Chicago trip, and have since gone on an adventure that started in Toronto and wove its way back to the United States, visiting several ballparks at once. This spring, the Massachusetts residents went on the Southerner, visiting Marlins Park, Tropicana Field, and SunTrust Park in Miami, Tampa, and Atlanta, respectively. Meanwhile, Stacie and Chad get to root for the Red Sox and Yankees, and chat about the umpire calls and other details of the thrilling games they see along with their fellow travelers, making lifelong friends in the process. In fact, when visiting Tampa, Stacie, and Chad asked Sports Travel and Tours’ Project Sales Coordinator Anthony Incampo if the three men—who live only an hour away—could get tickets and watch the game with them. Anthony helped make that outing happen.